Shaw’s Bank was one of the few Irish Private banks which survived the crises of the early 1800s and continued on in business until it merged with the Royal Bank of Ireland in 1836. Sir Robert Shaw, Thomas R. Needham and Ponsonby Shaw. Shaw's Bank, Dublin. £10 Ten Pounds, 13 January 1836. Signed by Robert Shaw. Interesting note, the latest date I have seen on an Irish Private Bank note. I wonder are there any later examples out there? 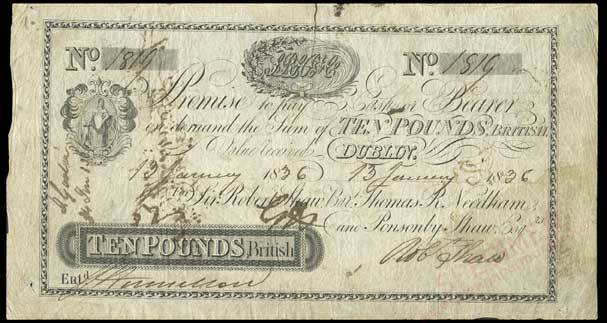 Here is a £1 note issued by this partnership in 1833. The reference to British was often seen on Irish notes issued after the Assimilation of Currencies Act, 1825. Here is an unissued earlier type of £1 from Shaw's Bank. There is no reference to £1 British so the note was probably issued before the Assimilation of Currencies Act, 1825. Notes of this type were probably issued between 1820 and 1825.